Replies: 48 (Who? ), Viewed: 127347 times. #1 14th Jun 2009 at 2:22 AM Last edited by plasticbox : 17th Sep 2009 at 1:01 PM. There was a tutorial for S2 (http://www.geocities.jp/invisiblesi...um01/index.html to build an Aquarium. What i did is to convert this to S3. I flat the ground (3 stairs) +one square wide. Now build the walls on the edges of the pool. The problem with the above is that the waterline gets somehow distroyed! If you mind forget about the flat tool and skip the last section. Now you can fill the slopes with foundations. 14th Jun 2009 at 2:31 AM Last edited by aphexZero : 14th Jun 2009 at 10:50 PM. This is fantastic! Thanks for sharing! The chimney doesn't look good. This is because i used half-walls for the roof. I don't see a way to cut it, yet. I tried to use standard objects for the household. Most of them are recolored to match each other. I decided not to flatten the pools edges to keep the nice waterline. Instead i changed the wallpapers. Now the triangular shape look like shadows, as you can see below. From here you have a good view on the pool! Thanks for the guide. After some mistakes I use to have a nice pool with a nice small fitness room. the difference between sims 2 instructions and sims3 instructions: none. i am not surprised. i do not have the game, but from this it is looking like the build tools in ts3 are mostly just the same as in ts2. I believe that this is why TS2 and TS3 building stuff share a forum. #8 23rd Jun 2009 at 11:17 PM Last edited by skdisk07 : 25th Jun 2009 at 3:26 AM. how do i get rid of the empty space in the middle where windows are standing?? I want your lot! It's so pretty, and I can never manage to make stuff like that in my game! Sweet! Thanks for sharing the tip, I'll have to give it a try! this is fantastic! thank you for showing us how to do this! Wow, now that is something I would have never thought of! Great job! Where do people come up with ideas like this?! Flatten out the pool base. Fixes your problem Xiaohuan, aswell as the water falling down near the windows. thanks for this tutorial! i had a blast with the constrain cheat the other night. i had my sim living in his pool. a table, chairs,fridge. i couldnt get the microwave to lower in the water. I don't think it does fix the problem. I had a perfect looking swimming pool while building the house, and I had flattened the pool bottom. Saved it, came back later and the waterline is all mucked up like in the above picture. Tried it a few times now, and end up with the same problem each time, some times during the build process, some times after saving and returning to it. Thanks for the great tutorial! However, I was hoping you could help. When I tried this I was able to get as far as cutting the wall in half but I can't seem to get further. Do you know how I can cut the wall in half? The flat too won't let me start at the top of the wall. Thanks for your help! 1: I tried to eliminate the sloped gap between the terrain and my basement wall - this causes the wall to go flying up. So I gave up on that and figured it wasn't that big of a deal. Let's help fund mammograms for everyone. If you want to help, Click To Give @ The Breast Cancer Site Your click is free. Thank you. 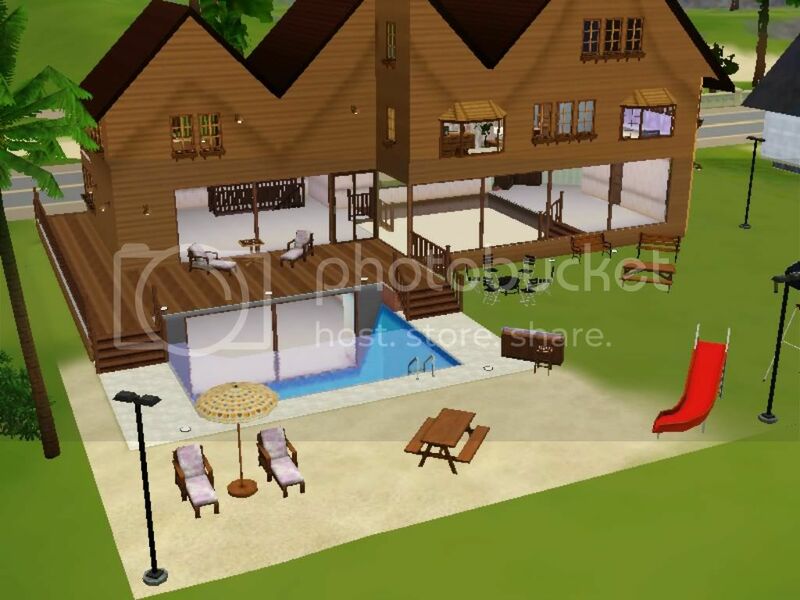 can u do this with a lake in ts2? #23 7th Jul 2009 at 8:00 PM Last edited by Aquateen : 7th Jul 2009 at 8:29 PM. Whenever I do this it just makes the half wall bigger/longer. Thank you so much for this incredible tutorial! I've been wanting to do this and didn't think it was possible. Now I can finally build my dream home!